The Bergen Festival is a yearly 9 day event featuring international bands from all around the world (their version of the Roskilde Festival) playing at all the venues in Bergen, from the largest to the smallest bars. One of the organizers put together this amazing bill of two Norwegian bands who are inspired and influenced by Hawkwind and also brought over Hawkwind themselves, who had not played in Bergen since 1974! 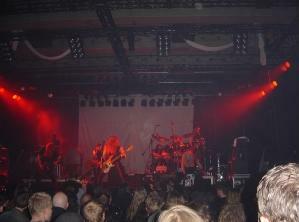 The event began a little after 22:00 with Enslaved. They were the local favourite and the place was pretty full (Capacity about 800). They play a pretty unique brand of death metal with two guitars, bass, drums (huge kit! ), keyboards and a guy who sang and played acoustic guitar on several songs. The crowd really got into it. It was a great sound and loud, as it should be. They had an excellent visual show as well. Another 30 minute break and Hawkwind was set up and ready to roll. The band opened up with a more electronic version of the classic track, "Spirit of the Age". It sounded so excellent. Dave was right up in the front of the stage most of the show playing his guitar with passion and power. He was dressed in skeleton pants and a Hawkwind t-shirt and very happy. They went into "Sword of the East", followed by a heavy new track about America's attempts to control the world called "Greenback Massacre". Mr. Dibs (from Spacehead, Alan's roadie), came out and read "The Black Corridor", which lead into "Psychedelic Warlords". The crowd was really into the show by now. Two new songs, "Out Here We Are" and "Angela Android" were next. These featured the really cool dancers that the band brought with them. They are really more like actors. They performed on about half the tracks. Next, Dave announced the next track as "Paradox" but actually they were going to play "Assassins of Allah". Dave then had the crowd laughing as he explained he was tired and should have been in bed! The classic "Assassins of Allah" had the crowd going again, although I think people dug the heavy "Angela Android" a lot as well. "Angels of Death" started with a electronic intro and then the heavy guitar. Phew… Now, we really got "Paradox". This was a real highlight of the show although I would prefer to hear Dave singing it himself as Richard's voice is much harsher and less melodic, plus he was louder than Dave! The lightshow with the really cool backdrop was excellent. This whole concert was being filmed on 7 cameras and 24 track audio for a future DVD release. After "Paradox", the band played another new song called "To Love a Machine". This also has quite a heavy guitar line. Mr. Dibs came out again and read "10 Seconds of Forever". The classic "Assault and Battery" into the "Golden Void" was next with "Where Are We Now" tacked on the end! Now, the band was joined by WE for "Brainstorm" and "Master of the Universe". Thomas did quite an excellent job on both numbers and Don played some cool additional guitar while Kris pounded away on a conga drum.Goshie and Tariq were playing somewhere in the dark background as well. It was a great ending to the show. The crowd were yelling for more but Dave was really tired as it was now 3 in the morning. An amazing night that I will never forget!